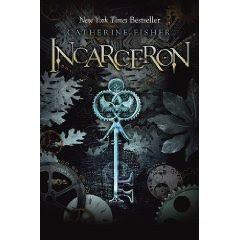 Incarceron by Catherine Fisher. Dial Books, an imprint of Penguin Books. 2010. Reviewed from ARC from ALA Midwinter. The Plot: Finn, seventeen, is a prisoner in Incarceron. A prison created generations ago, a prison that runs itself so needs no guards, a prison so large that no one knows all its secrets. Rumors and myths exist of one person, Sapphique, who escaped to Outside. Claudia is the daughter of the Warden of Incarceron. The technology that created Incarceron is almost lost, because of the Protocol to create a Tudorish time period for the world to live in and freeze time at that moment. She is to marry the heir to the kingdom, but finds that the politics and machinations of her world includes lost heirs and conspiracies she doesn't fully understand. Finn finds a Key. Claudia finds a Key. He wants a way Outside; and she is looking for answers in Incarceron. The Good: Catherine Fisher does not disappoint! The dual stories of Finn and Claudia twin each other; both prisoners, Finn literally, and Claudia a prison to her familial expectations. Both have pasts they don't quite understand. Finn is "cell born," with no true memories of his life before three years past when he awoke in a cell. Claudia is the Warden's daughter, with a mother never mentioned; she has been groomed to wed the Prince, the heir to the kingdom. And Incarceron -- a prison unlike any other. Prisoners, descendants of those who first were condemned to Incarceron, live knowing Incarceron is always watching; it needs no guards. Sometimes the inmates are left to their fights and schemes and battles, other times it interferes to keep some type of order. Imagine dumping criminals into a prison and locking the door? Yes, it turns out about as well as you would imagine. Interestingly enough, Incarceron was created to be a paradise, to contain those the world did not want but not to punish. Whether it's peoples natures that cannot be changed, or that Incarceron operates outside its initial programming, the fact remains -- Incarceron is a hell of survival and brutality. The Outside world is "frozen" in time, under the belief that somehow, by stopping progress, by removing fear of future, all will be well. While Fisher names no specific time, the descriptions seem to be that of the Tudor world, including the politics and double dealing of the Tudor court. One wonders if the person who selected that time only looked at paintings of castles and lush outfits and ignored the history of double-dealings, betrayals, and constant struggle for power. Because there are two narratives, two stories, there is a fairly large cast of characters. Each one is fully drawn; very real; and I have to say, while Finn and Claudia are the main charactes, the two I really love are Finn's oathbrother, Keiro, and another of his companions, Attia. Keiro is charming and brutal, yet dedicated and loyal to Finn. Oh, I'll just admit it.... Keiro is the ultimate bad boy! And while Finn asserts some bad boy cred himself -- he has been living with a criminal band, so is no angel -- he just doesn't come across as the bad boy. Attia is loyal, also, to Finn, almost pure in her loyalty. From the moment Claudia mentions a lost heir, who went missing at the same time Finn found himself in Incarceron, one begins to connect the dots. Finn has flashes of memory, memories that seem to match the lost Prince. But is he the lost Prince? Is Claudia looking to save Finn, or using him to save herself from a marriage to the younger brother of the lost Prince? So many questions. So many secrets. So many surprises. Too many -- because there are only some answers, some reveals. While Incarceron's ending is satisfying and I would not call it a cliffhanger, it does leave the reader hanging and wanting more. My reviews of Fisher's other work have noted Fisher's use of myths and legends. Incarceron uses existing myths and legends, yes ... Three Fates and Alice in Wonderland both are mentioned... but Fisher has created her own mythology and world. There are the beliefs of the prisoners of Incarceron, including the legends of Sapphique; and the beliefs and history of the world Outside. Another favorite book of 2010! See sidebar. Wow, that list is growing fast. Great review! I so loved this book when I read the UK edition a couple of years ago for the Cybils. I'm really glad that it's finally published in the US. Thanks for the review. I've got this book sitting in my "To be read" pile, and it sounds intriguing enough, it just might be next. Sheila, have you read the second one? I can't wait for it! Krystey, let me know what you think after you've read it. After reading your review I am definitely going to give this a try. It sounds really interesting especially with the possible connections to the Tudor court. I love Tudor history so I will be looking out for that. Thanks for sharing your thoughts. Excellent review. I really, REALLY want to read this book. I've heard so many good things about it and your review makes me even more intrigued!